The Blues had already experienced a couple of disappointing defeats at Arsenal and Bournemouth since the turn of the year and they happened to suffer further embarrassment with Manchester City rolling them down by a comfortable 6-0 scoreline. Speaking after the game, Carragher believes the Blues are going into the trend of struggling against the big teams on the road which was been quite evident with the Gunners over the past decade. He told Sky Sports News. 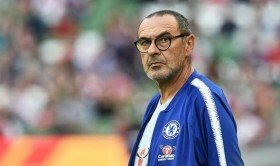 "Looking at Sarri, just over halfway through his first season, but the worst thing I can say is it looks like he's turned Chelsea into Arsenal under Arsene Wenger." With the defeat, the Blues have dropped to sixth on the Premier League table behind the Gunners by virtue of the goals scored through the league campaign. Next up, they shift their attention to Europa League football on Thursday night where they face Swedish outfit Malmo on the road. Thereafter, they have a testing FA Cup quarter-final against Manchester United at the Bridge.